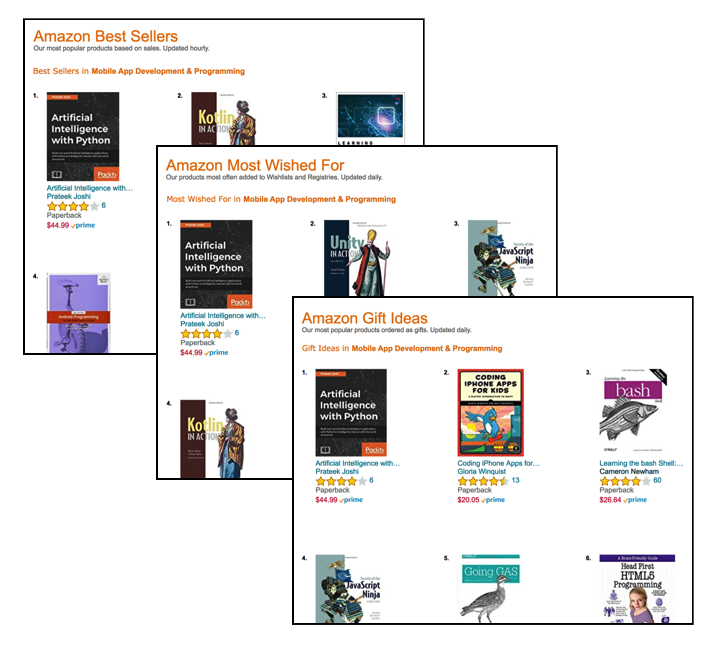 Artificial Intelligence with Python - This book is the #1 Best Seller, #1 Most Wished for, and #1 Gift Idea on Amazon in its category. It is centered on building real world Artificial Intelligence applications using Deep Learning, Genetic Algorithms, Reinforcement Learning, Logic Programming, and many more techniques. Python Machine Learning Cookbook (First Edition) - This book focuses on creating real world Machine Learning applications like recommendation engine, speech recognition, and stock market analysis. Python Machine Learning Cookbook (Second Edition) - This book helps you discover powerful ways to effectively solve real-world machine learning problems using key libraries including scikit-learn, TensorFlow, and PyTorch. Python: Real World Machine Learning - This book discusses topics such as image recognition, natural language processing, and large scale data analysis using Hadoop and Spark. Learn OpenCV 4 By Building Projects - This book explores OpenCV 4 to create visually appealing cross-platform computer vision applications. Building Computer Vision Projects with OpenCV 4 and C++ - This book delves into practical computer vision and image processing projects to leveraging relevant machine learning algorithms. OpenCV: Computer Vision Projects with Python - This book discusses many interesting applications like gesture recognition, street sign recognition, and facial emotion recognition. OpenCV with Python by Example - This book focuses on developing Computer Vision applications using real-world examples like visual search, 3D mapping, and augmented reality. OpenCV 3.x with Python by Example - This book focuses on techniques for object recognition, 3D reconstruction, stereo imaging, and other computer vision applications using examples on different functions of OpenCV. OpenCV by Example - This book discusses Computer Vision concepts and demonstrates how to build OpenCV C++ applications like object tracking, image segmentation, and OCR. Build with OpenCV - This book is for developers who want to build Computer Vision applications like image segmentation, automated video analysis, and text recognition using OpenCV and C++. Filed multiple patents centered on the algorithms developed for body measurements using smartphone, 3D modeling, and visual search. Tech Demo on High Dynamic Range Imaging at CES 2012 (Consumer Electronics Show), Las Vegas, Nevada, January 2012. Prateek Joshi and C. -C. Jay Kuo, "Security and Privacy in Online Social Networks - A Survey", IEEE International Conference on Multimedia and Expo (ICME), Barcelona, Spain, July 2011. Tech Demos on Augmented Reality, Face Detection and Seam Carving at IEEE Computer Vision and Pattern Recognition (CVPR) conference, Colorado Springs, Colorado, USA, June 2011. Represented Nvidia in augmented reality conference ARE2011, Santa Clara, California, May 2011.